Attendance was on pace to set records, but Matthew caused many preregistered attendees to miss the show. 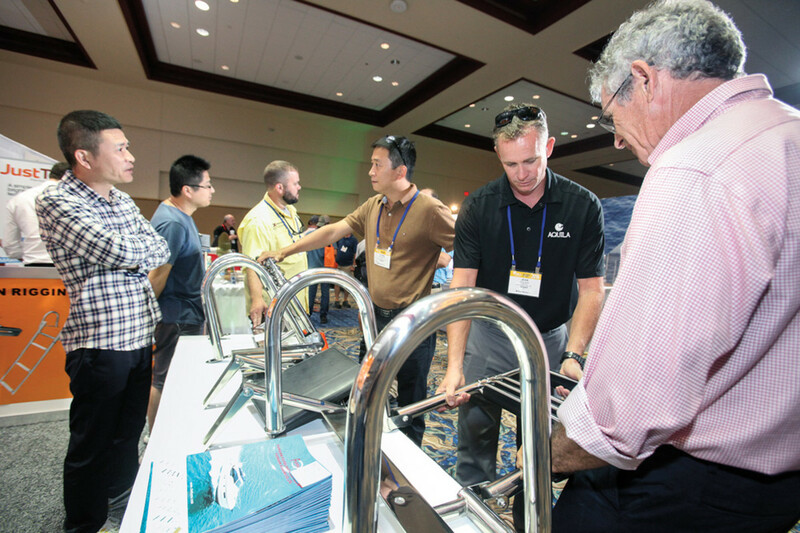 The 26th annual International BoatBuilders’ Exhibition & Conference got off to a fast start before Hurricane Andrew interrupted it, forcing exhibitors to leave early, keeping attendance from reaching record levels and forcing an early closing. 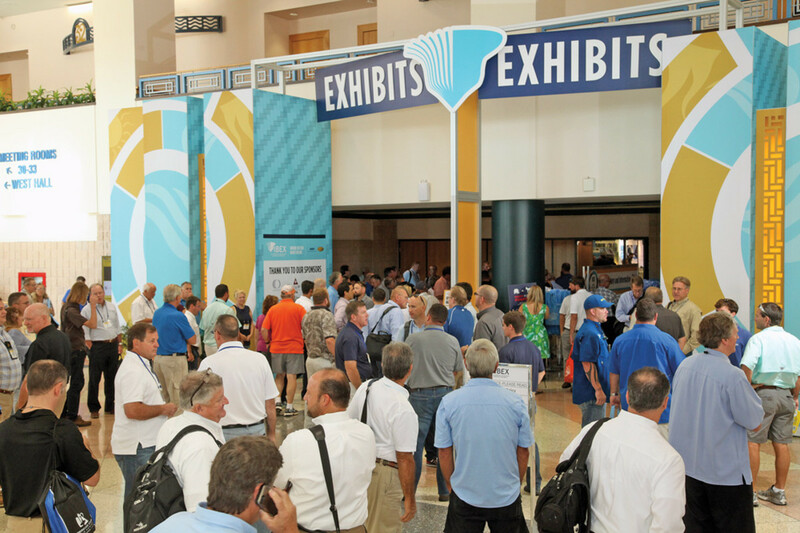 IBEX drew 6,000 marine professionals to the Tampa Convention Center, where 556 exhibitors filled 118,000 square feet of sold-out space on two floors. Attendance was expected to eclipse 7,000. IBEX kicked off on Oct. 3 with seminars. The show was scheduled to run from 9 a.m. Tuesday, Oct. 4, to 3 p.m. Thursday, Oct. 6. With Matthew on track to hit Florida, IBEX leaders decided to shut down the show at 12:30 p.m. (2-1/2 hours early) on the final day. steel marine and boat hardware) had 42 boatbuilders take a look at its outdoor display, says Bridgewater. The outdoor displays were a big hit, giving exhibitors such as SeaStar Solutions a chance to demonstrate their products. A whopping 1,500 preregistered attendees never came to the show, says Dunbar. “We usually only have maybe 200 no-shows,” she says. “This year’s large number is a big indicator of the storm’s impact.” More than 70 exhibitors had left by Wednesday morning, she says. Matthew overshadowed some big — and good — news for the future of IBEX. RAI Amsterdam, the group that owns and produces METS Trade, purchased a 50 percent stake in IBEX, buying out WoodenBoat Publications, publisher of IBEX founder Professional BoatBuilder magazine. 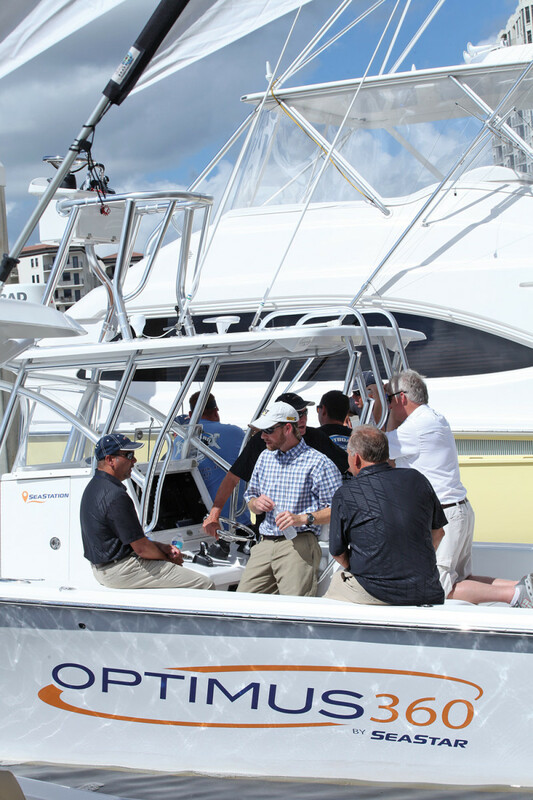 RAI will work with the National Marine Manufacturers Association to produce future IBEX events, helping to grow attendance and increase exhibits and sponsorships. The partnership should bring more international business to IBEX at a prosperous time in the marine industry, said NMMA president Thom Dammrich. The marine industry should grow for two to three more years as consumer confidence and spending continue to strengthen, Dammrich told the audience in his state of the industry address at the breakfast. “There are a lot of things going well in our industry,” Dammrich said. “These really are good times in our industry, and fortunately those good times are going to continue. Most segments in new-boat sales are increasing. PWC sales have shot up 15.5 percent, pontoons are up 11.5 percent, and saltwater fishing boats, as well as runabouts, grew 9.4 percent — this is on a rolling 12-month basis year-over-year from June of last year to June this year. Dammrich also talked about the leading states. Alabama and Florida were the top two states in 2015 for new-boat spending. Spending increased by more than 10 percent in both states. Michigan and Wisconsin also were top states in spending. Growth in real disposable income, the real gross domestic product and consumer confidence have fueled the industry’s success of late, he said. Lean new-boat inventories have helped, too, Dammrich said. The NMMA has been working on collecting data with an economic consulting company that has projected the industry will continue to expand through March 2019. “That is another two and a half years of growth for our industry — that is pretty good,” said Dammrich. The partnership with RAI should lure more international exhibitors and attendees to IBEX. IBEX will be held at the Tampa Convention Center in 2017 and 2018. “We sold out this year,” Dunbar said during a media briefing after the RAI announcement. “That is one of our challenges. We are too big for this convention center. We’re contracted for three years here, and we’re going to maximize the space.” Dunbar said 90 companies are on the exhibitor waiting list. There were 45 international exhibitors this year, said Dunbar. IBEX lost some international exhibitors when the show moved from Miami to Louisville in 2008. At the press meeting, Dunbar and Dammrich were joined by Boersma and Rens-Jan van Vliet, the METS product manager, who will also become the IBEX global sales and marketing manager. One of the convention center’s biggest assets is its waterfront location (where in-water demos have been set up). But the chances of finding another larger venue on the water are minimal, said Dammrich.